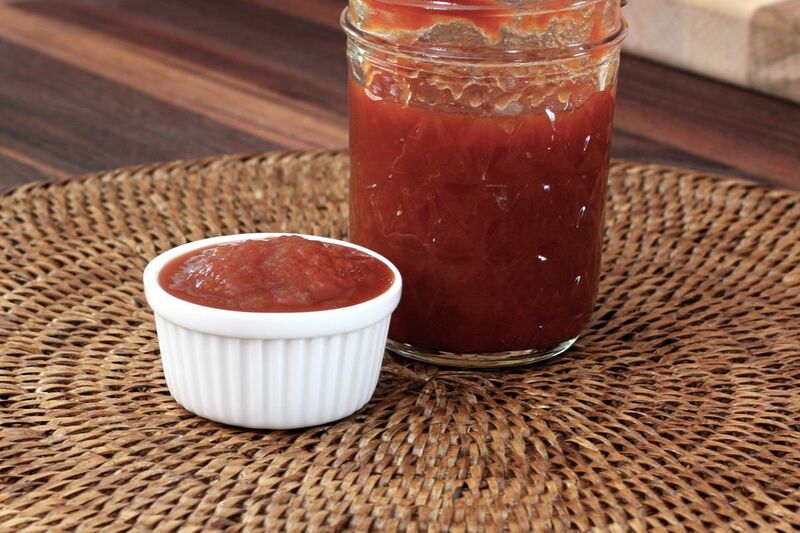 This homemade ketchup takes time and tomatoes, but the final result is well worth the effort, especially if you have an abundance of fresh tomatoes. Start preparation a day in advance and then refrigerate the tomato pulp and liquid mixture. Simmer and can the ketchup the next day. Put the celery seeds, cloves, cinnamon, allspice, and mustard seeds in a cheesecloth bag. Tie up and set aside. In a small stainless steel or enamel-lined saucepan, combine the vinegar and spice bag. Bring to a full boil. Remove from heat and let stand for 25 minutes. Remove the spice bag and discard. Set the vinegar aside. In a large stainless steel or enamel-lined kettle (at least 8- to 12-quart size), combine the chopped tomatoes, garlic, onion, and red pepper or cayenne. Bring to a boil, stirring frequently. Reduce heat to medium-low and continue at a gentle boil, stirring frequently, for 25 minutes. Add the spiced vinegar to the tomato mixture and continue cooking, stirring frequently, for 30 minutes longer. Drain the tomatoes into a large stainless steel saucepan, then put them through a food mill to extract as much juice and pulp into the saucepan as possible. Discard the solids. Add the granulated sugar, the brown sugar, and the salt to the extracted pulp and juices. At this point, you can refrigerate this mixture overnight and finish the next day. Otherwise, bring the tomato pulp mixture to a boil over medium-high heat, then reduce heat to medium-low and boil for about 2 hours, or until reduced by about 2/3 and thickened to a ketchup consistency. Meanwhile, prepare the work area, canner, jars, and lids. If you've never canned anything before or are just looking for a refresher, take a peek at out guide for preparing jars for canning and boiling water processing. Fill jars, leaving 1/2-inch headspace. Use a small plastic or stainless steel spatula to remove air bubbles, wipe rims with a damp cloth, and fit with lids and seals. Transfer to a rack in the canner and lower into the hot water. Add more water, as needed, so you have 1 inch over the jars. Cover, bring to a boil and continue boiling gently for 15 minutes. Once they are done, use tongs to remove the jars from the water and place them on a rack to cool. Use on your favorite foods like hamburgers, hot dogs, French fries, and more, and enjoy!